There are eight types of thrushes including the native and vagrant species that have been seen in North America. This does not include other bird species such as the bluebirds, robins, fieldfare, Veery and Solitaire, who are all members of the thrush family. Thrushes most often prefer dense and moist forest areas where their sweet melodies can be heard but the bird itself is seldom seen. Thrushes are long distance flyers and migrate from North America into South America in the colder seasons. 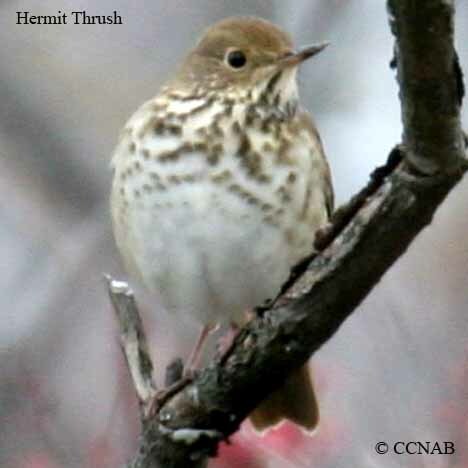 From the wide range of the Hermit Thrush and the Swainson's Thrush to the very local areas of the Bicknell's Thrush, who prefers the higher altitude of the eastern mountains of the Maritime provinces of Canada and the northeastern states of the USA. The Wood Thrush lives in the eastern States and the southeastern parts of Canada. Then, there are the two most northern species, the Gray-cheeked Thrush, who has a range across all of northern Canada and the Varied Thrush, with a range from Alaska into the southern Rockies. The Aztec Thrush and the Red-legged Thrush are vagrants who inhabit Mexico, Central America and the Islands of the Caribbean and are sometimes seen in the southern regions of the USA.